Knitting Sandwich: woot woot snow day!! we have our first official snow day today! 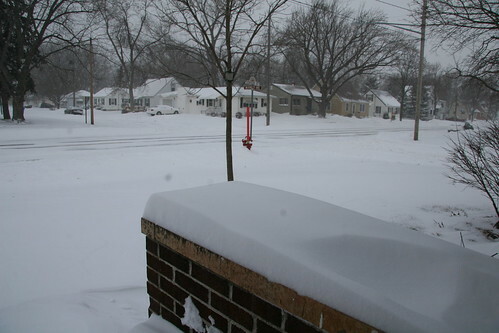 i don't think we got hit as hard as a lot of places in the midwest, but it was enough to cancel school. it's a lazy shot taken by opening my front door, snapping the picture, then quickly closing the door again. because (a) it's cold - windchills are below zero and (b) in true snow day fashion i am still in my jams. so what is one to do with a whole snowy day before them? luckily for me i have the perfect solution. yesterday the final package of squares for my bundles of joy blanket project arrived at my door (talk about perfect timing!). thanks to the generosity of kate, rebekah, claire and especially korin (who gifted me with her entire stash of knitted squares!) i will be able to make three blankets!! thank you again for your help, there is no way i could have done this without you. i have to knit a couple more squares to round out the sets and then i'll start seaming. luckily i don't have to knit alone today. ms. lillian has decided she wants to make the cats christmas presents this year, so she's knitting them up little garter squares that we'll seam and fill with catnip! it's a mother-daughter project. she knits a row or two then i knit a few. 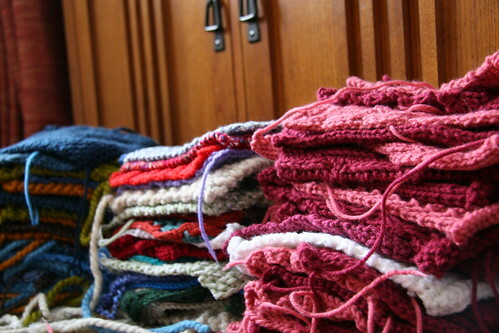 the perfect snuggly project for such a blustery snowy day! Enjoy a cosy time indoors ! Ooohhh snow day! Fun! It's been really cold here but no snow. 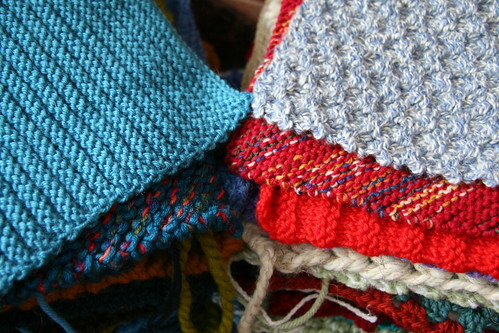 What a snuggly project for a snow day. woo hoo snowday! thanks for the picture-- it's so nice to live vicariously! the square project looks AWESOME-- what a wonderful thing you're doing! and lily's cat christmas presents are just too sweet. what a lovely daughter you have! What a great day to snuggle and knit! Although I think my eye starting twitching thinking of seaming up 3 baby blankets! :) Glad to see you got enough to meet your goal...and more. It's a great thing you are doing! yay for a snow day! We had a windstorm yesterday which was heavy enough to knock over my 30 pound terra cotta planters off our front porch...craziness! But, still there's not a lot of snow. Those squares looks so soft and squishy. I can't wait to see the blankets that you make with them. Your kitties are going to love those catnip toys! I made a felted catnip mouse a few years ago and our cats played with them and chewed them so much that they ripped open the filling...I should make them some replacements for this Christmas. Love snow days--great for hunkering down and knitting! Wish I could snuggle up with you guys and knit, it sounds like a perfect day. Oooh, snow! We're still waiting for our first snowfall, which for reasons I won't get into here, I'm wanting to wait for a while. 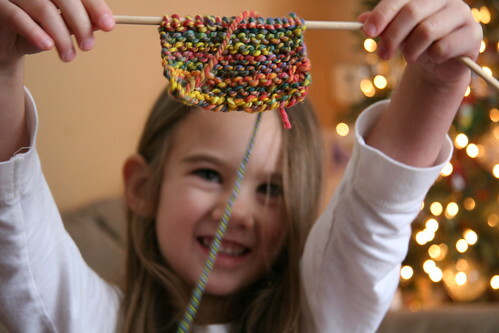 Great charity project, and lovely that you have a knitting friend in your daughter! Snow day! They happen over here far too infrequently! Looks like you and Lily had a fun time!